​Key Features: Large spring-time dark pink / red flowers; regular size and compact shape; good tree for wildlife; avenue tree. 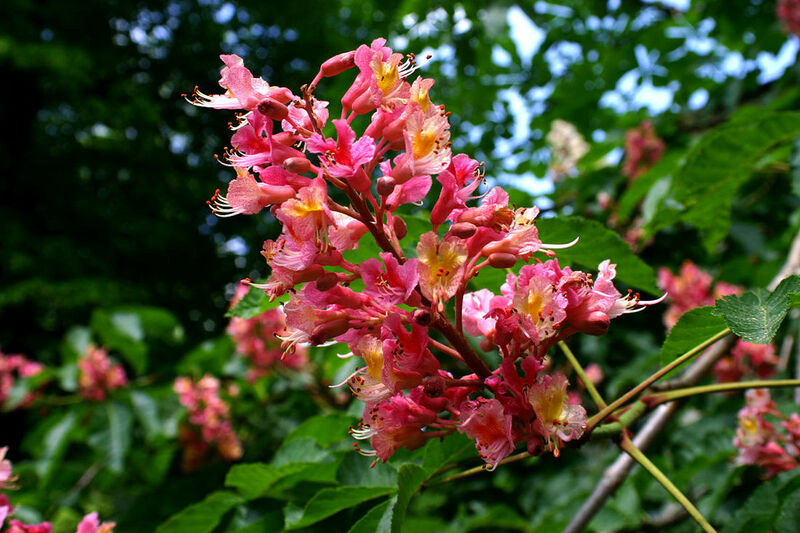 The Red Horse Chestnut is a beautifully proportioned and rounded tree for the medium to large garden or open space. It has been favorite amongst our gardens and parklands for many decades after first being discovered in 1858 and has been awarded the RHS’s Award of Garden Merit in 1984 and 2002. Its symmetrical and regular habit mean it is often grown as an avenue tree lining a driveway or framing a view line. The deep pink almost red flowering panicles can reach 20cm and cover the tree during May. Whilst it does produce chestnuts most years they are both smaller and less spiny than our native Chestnut. The foliage and indeed the whole tree is likewise similar to our native chestnut but is darker green in colour and more compact making it more user friendly in smaller spaces. Aesculus x carnea ‘Briotii’ grows well on any reasonable soil and is fully hardy.